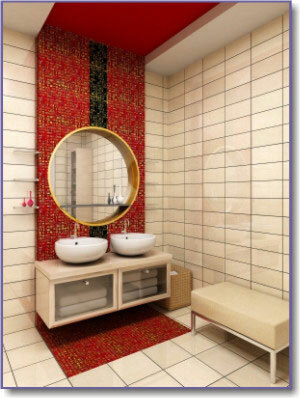 A red bathroom can be sensual and daring and this color scheme fits a variety of bathroom styles. It can be used in a funky and playful way in a modern bathroom or add drama to a vintage bathroom. 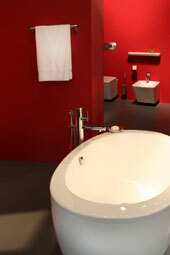 Red is such a versatile color and it can be paired with so many bathroom colors in such exiting combinations. 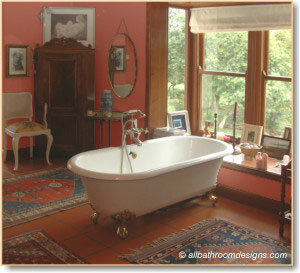 The rich and vibrant colors in the Persian rugs form the basis for the colors used in this Victorian bathroom. The current wall color picks up on the red in the rugs, but it could so easily be painted in blue for example, to create a totally different look. Unlike the cool colors (blues and greens) that are receding, red is an enclosing color. It can dominate a space and make a room appear smaller, but in doing that, create a warm and cozy space. There are so many hues and shades of red to play with: Cadmium red (bright, with orange overtones), Venetian red (with brown overtones), Burgundy, Scarlet... just the names of the various pigments are so evocative. The complementary color for red is green - and there too are so many shades and tints to choose from - so let's start playing with various red color schemes! 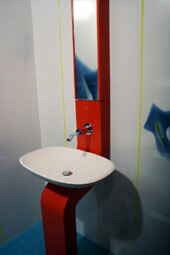 Choosing a chartreuse or lime green as complementary color to a bright red adds a vibrant touch to a modern bathroom. Conversely, combining a deep red or burgundy with a darker green will create a more classic or sophisticated look in a red bathroom. Red combined with black is dramatic and can make a strong design statement. A curved wall (here's the architectural detail bit again) clad in red subway tiles forms such a strong focal point in this powder room. Black trim around the boxed-in mirror and a black lattice vanity top add the finishing touches. 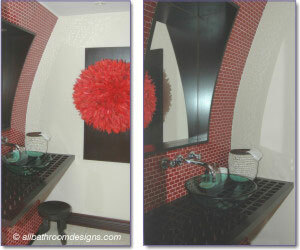 Red and black together can also be perfect if you want to create a masculine bathroom or a Japanese bathroom. Red works very well with white too - whether you want to use red as an accent color only or whether you want a predominately red bathroom with white accessories. Experiment with different hues to create the bathroom style you want: pure reds for a contemporary style and deeper, richer reds for a classic look. You may also want to consider combining red with a strong purple (not lilac or mauve) where the effect can be sumptuous and regal. 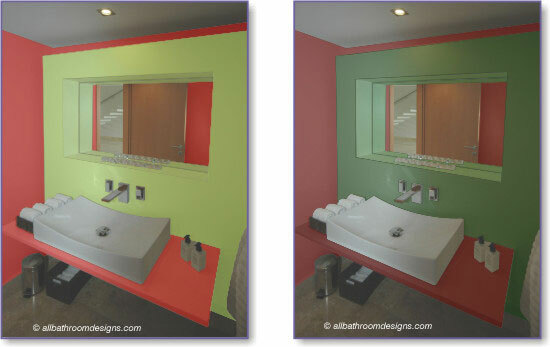 Design Note: Have a look at your bathroom walls and ceiling and see where you can add dimension! Bathroom design encompasses more than just bathroom decorating. Design also considers the addition (or removal!) of structural elements in order to make for a more creative bathroom layout and so to enhance the decorating effects. The architectural detail in combination with the use of color work together to create focal areas and visual interest. Tricky Colors to use in a Red Bathroom!? Bright yellow and red: Just as a point of interest, this color combination is often used by marketers to indicate a budget/low-priced brand - not quite the impression that you want to create with your bathroom design! A better solution may be burgundy teamed with gold or ochre. Primary colors though (blue, red and yellow) can be used to great effect in a child's bathroom or a bathroom with a retro feel. Bright red with blue: Be careful of the sky-blue colors (shades of Cerulean). An easier blue to work with will be shades of Indigo. 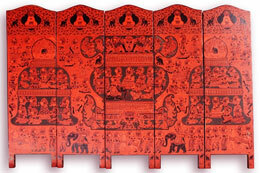 A deeper red can work well though with blues as is often seen in Moroccan or Mediterranean decor. Bright red with baby pink! If you've used any of the above "tricky colors" to great effect in your bathroom, please Contact Us - we'd love to see your bathroom! In fact, we'd love to see your red bathroom in any other color combination too. Design Note: Color combinations should not be used in equal quantities. The accent color's function is not to compete with, but to enhance (complement) the main color and by doing so, creating a pleasing effect. Your bathroom color schemes can expand from a beautiful feature piece such as a red lacquered screen, an antique barber's chair with red leather or an ornate red chest of drawers converted to a vanity. Have a look at industrial red vinyl flooring (those with the coin patterns) - it's non-slip and warm underfoot and adds a cheeky touch. 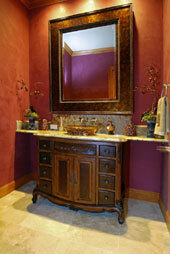 Custom design your own vanity and bath and have it made in red concrete. Use red Perspex as backsplash for the vanity and bath and even the shower stall. 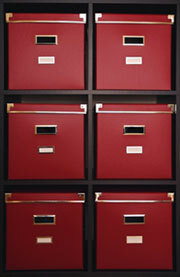 A stack of red office boxes looks great and are perfect for storage in a red bathroom.